This new album from Levin, Minnemann and Rudess is a masterpiece. It's likely to make my best of 2016 list. It's the kind of thing you expect from these guys, but that doesn't mean it's predictable. It's basically purely instrumental (one song has some minor spoken vocals). This has more symphonic prog moments, more fusion-like ones and others that are closer to what you'd expect from Levin's era of King Crimson music. Sure, comparisons to Dixie Dregs and Dream Theater can often be made, as well. I suppose some legal jargon is mandatory for this review. Warning: your results may vary. This does not represent legal advice. 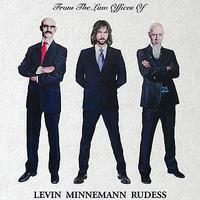 Consult the legal firm of Levin Minnemann and Rudess for more information. I can't imagine a better opener. This has a driving groove. It's complex, but never loses sight of the melody and the "song." There are sections that have a rather King Crimson-like vibe, but there are also movements that make me think of Yes quite a bit. It's a killer instrumental and great lead off piece. Starting with more of a complex rhythmic groove, this thing gets into some killer fusion-like territory. It's not as mainstream or instantly accessible as the opener was, but it also doesn't feel alienating. There are some killer melodic movements, and weird little diversions. This starts with trade-mark Tony Levin. It builds out to something that's more in line with King Crimson or Bruford Levin Upper Extremities. This is a scorching hot tune that has some crazed jamming built into it. It gets pretty hard rocking and rather intense at times. The opening section here is tastefully odd. The cut grows out from there into more melodic progressive rock. It calls to mind something like Tangerine Dream at times. There are some really classic sounding musical excursions built into this. At times I'm reminded of ELP a bit. There are some vocals here (just the title), but they are more like an instrument and quite far down in the mix. It could actually be a sample. This thing gets really crunchy at times. There are some exceptional symphonic prog sections as the keyboards drive it later. The title vocal comes back at the end along with some odd rhythmic elements. Funk and jazz merge on the opening of this track. The number works out from there with a great rhythm structure holding it together. There are definitely fusion elements that remain, but it builds to more traditional prog. There is a changeup section that makes me think of something Frank Zappa might do if he were playing with ELP. The cut continues shifting and changing. This powers in with a jam that's almost heavy metal. It's a screaming hot prog rock jam. Then it makes a left turn into something that makes me think of Gentle Giant a bit before launching from there into screaming symphonic prog. This is packed with fast paced changes. It drops back to just bass at the end. The opening segment here has "Tony Levin" written all over it. The piece works out from there. Some whistling is heard over the top. There are hints of something like Pat Metheny on this to me. It definitely has a fusion edge, but with more of a King Crimson texture infused. This thing gets into some tastefully strange territory later. This is another that is constantly changing and rearranging. It has some very playful stuff alternated with some more pure symphonic prog. This is mellower and more consistent. It's a nice respite from some of the crazed music around it. That said, this is still prog rock, so don't expect a completely straight line. More crazed prog opens this and gives way to a melodic jam. Then they power out into fast paced stuff from there. There are some unusual changes on this. Some parts take us into fusion territory. Other things land in the vicinity of King Crimson. The opening section here makes me think of Herbie Hancock's electronic era. There is definitely a fusion thing going on here. The cut has a cool groove. This shorter piece lands more in the vein of melodic prog turned fusion. The piano solo movement brings it into more purely jazz based territory before it works out to more rocking stuff. It connects directly into the next number. A driving rhythm section that makes me think of Bruford Levin Upper Extremities drives this as the cut really pounds forward. This is a killer track that covers a lot of varied territory. It gets into more symphonic prog later in the number. Keyboards end it. The keyboards that open this piece are pretty and rather dream-like as they build out. The cut gets more of a rock element infused as the other instruments join. While this is still fusion and prog oriented, it does have more of a mainstream rock groove. There is some pretty intense and soaring instrumental exploration on this cut. The melodies really carry it, while the basic song structure is one of the most static and constant. They do drop it way down for a mellow movement, though. This fires out into a killer, slightly off-kilter jam that's very much in line with 1980s King Crimson. It's heavy and a bit dark. It's also tastefully strange. It works around various corners as it pushes forward. There is some intense and very powerful jamming in place on this. I love the funky drop back section on this. There is a weird little thing at the end. This is so pretty and dramatic. It's a balladic cut that feels very sad and rather symphonic. Now, this fast paced rhythmically driven thing really sounds like something from Bruford Levin Upper Extremities to me. It gets into some almost circus music oriented stuff. It's crazed, frantic and very cool. The drop back for some melodic soloing it tasteful and quite cool. A different version of the earlier cut, this comes in atmospheric and tentative. Then the rhythm section powers up to drive it in smoking hot ways. I love the jamming on this. It's less odd than the other version. It's more of a driving, heavy prog sound. There are definitely power trio elements at play here. As cool as the version on the album proper was, I think I prefer this one.